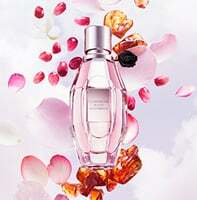 The new Eau de Toilette continues the iconic addiction of the Flowerbomb floral bouquet, adding in a breath of fresh air with a burst of fresh spring flowers to bring a fresh, sparkling and sensuous tone. A burst of fresh flowers with a subtle aerial undertones – announcing the return of Spring. In its iconic grenade-shaped bottle, Flowerbomb Bloom was redesigned into a more slender bottle – triggering an unprecedented floral burst. Intense, sparkling, fresh and sensuous. A fresh rewriting of Flowerbomb, Bloom’s floral signature becomes aerial with a breath of flowers – led by the delicate essence of sparkling pomegranate. Woody tones of patchouli are enhanced by musky vanilla – giving the beloved fragrance an extra layer of sensuous complexity. A seductive alchemy that will leave many captivated hearts in its trail. Flowerbomb Bloom is rated 5.0 out of 5 by 17. Rated 5 out of 5 by Jenboo from Love this scent! This is my new favorite scent. I was using Jimmy choo which faded quickly, but this scent is similar, lasts and is absolutely great! Unlike the original flower bomb this scent is smoother and more citrus/ floral with a less intense smell but still lingers on. Rated 5 out of 5 by PNWGirl from LOVE this scent Have been buying this scent for years, and have lots of friends and family young and old hooked as well. Makes gift giving easy! It is fruity and floral and I really dislike musk so I disagree with the description. I don't smell musk at all which in my book is a great thing! Lasts well too. Rated 5 out of 5 by Nikita from Best perfume ever I love this fragance, so much that I can’t have enough of it! My favorite is the original Flowerbomb but the bloom is less overpowering without loses the sweetness.. Totally recommended for spring/ summer season. Easily it had been became in my second favorite fragance of all time. Rated 5 out of 5 by Gifter from Flowerbomb for Gift Giving The Flowerbomb scent is my only choice for a gift for others. It agrees with every woman young or old. The variety of products suits everyone's wish list. I always see a big smile when my gift recipient unwraps a Flowerbomb gift! Rated 5 out of 5 by PamPam from bloom extremely wonderful smell purchased it for my mother fits her very well she loves a hint of class and elegance but a hint of sweetness last on her for days... love it i steal it from her and it fits me as well love must have !